Year after year, I am asked the same question, "How do I keep ducks away from our pool?". Obviously, with the amount of money it costs to have a pool built, it is such a pain having these feathered fowl enjoy it as their own. 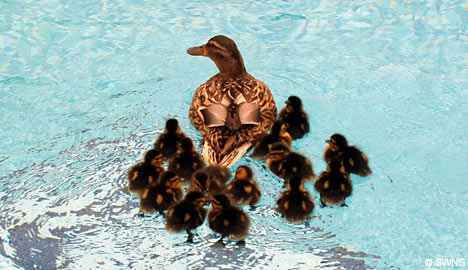 Fyi, Putting a floater that looks like a real duck only encourages a whole flock to take up residency in your pool. No good. Here are some proven methods, as well as one not many know about, to keep them out. 1) Remove anything that might attract birds to your yard, such as a bird feeder or a bird bath. Take away all flowers or plants that might lure birds into your garden. 2) Buy a fake replica of a predator to scare the birds away. Most people opt for owls, which can be placed in or hung from a nearby tree or awning. Some birds might respond better to rubber snakes or alligators placed around the perimeter of the pool. 3) Keep the birds away by moving the predators every few days. Some pool owners think it is easier to buy a mechanical replica that detects motion. For example, some owl replicas will flap their wings or move their heads when they sense movement in your yard. 4) Place a toy or object in the water when the pool is not covered. Some pool owners have used an inflatable dolphin will keep birds out of your swimming pool area. 5) Choose a holographic product for a more aesthetically pleasing alternative, such as such as Irri-Tape. The combination of the movement and the light reflecting from the water surface will keep birds out of your swimming pool. Alternatively, some people like a product called Terror Eyes, which is a balloon with holographic eyes. 6) Although this is a little different approach, many who use this method say it works great. A friend told me that his daughter, who is a zoo keeper, brought home a tiger cub for domesticating. While there, the cat used the bathroom in the yard and around the pool. He said he was so surprised by the positive results, that he told others in the neighborhood. They found a product online that is just sprinkled here and there, around the pool (mostly in foliage areas). It is safe due to the concentration of the product. 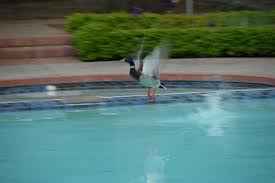 I once had a customer that thought putting 2 cases of muriatic acid in the pool would burn the ducks as they landed, and therefore, would ward them off. What did I tell her? That's 1 for the ducks and 0 for the homeowner. I wound up having to drain the whole pool and start over with fresh water. Please don't do that! !